ATLANTA, Ga. – In 2015, an entire roster and coaching staff quit in Orlando while speeding in a spiral towards the black hole of a winless season. From Shaquem Griffin’s perspective, players were more concerned with their future beyond UCF than the week at hand. Shoot, they were more worried about their dinner plans. “It wasn’t just the players who were divided. The entire team from the coaching staff to the players, and it’s hard to win games when you have coaches worrying about something else besides the players. It just made it tougher on us, because not only are we trying to build something together, but he had to make sure we had our coaches on the same board as us. If we don’t build in spring and summer it’s going to be hard to build during the season – it’s kind of too late after that,” he reinforced. 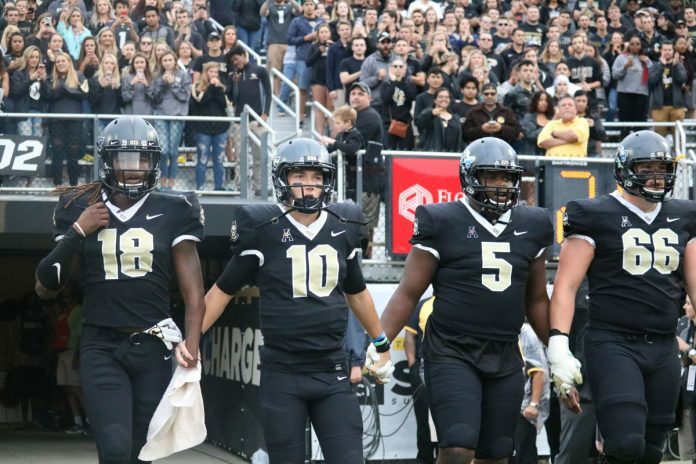 There was no guaranteed landing spot for anybody – especially as we see the old brand of UCF’s longtime icon fade in favor of the new generation’s high-speed warfare. The phrase “culture change” gets thrown all too often in the college coaching carousel. Anytime the season comes ‘round, incoming coaching staffs everywhere stake an ownership claim on a key to the utopian future of tomorrow. To the Black and Gold faithful, Scott Frost’s arrival and promise of change meant an I.V. of adrenaline. It meant the Chip Kelly disciple would lift UCF out of football’s most fundamental evolution and into the modern-day apex of the game. This we all saw, clear as day. To the hungry roster he inherited, starving for guidance, Frost’s arrival brought the promise of not just team unity, but team responsibility. His arrival meant discarding the absolute power system of their former despot and distributing a sense of ownership throughout the team. The buy-in was instant. Never wanting to fall into the darkness of 0-12 again, the team would police themselves and establish a culture of accountability. Across the program, attendance shot up to off-field and team activities. “Coach Frost always told us you guys, this is your team. You come together, you make the decisions,” said wide receiver Tre’Quan Smith. Punishment runs and physical exhaustion happened from time to time, but after the first year of results, the responsibilities elevated from maintenance to the pursuit of greatness. “Knowing that this is our team and that it’s up to us to fix it. The coaches aren’t out there playing on the field, they’re just calling the plays. We’re the ones executing the plays,” insists Miller. It wasn’t easy to establish a culture where players were unafraid to challenge each other to be better. To stand up to the norms and shake what was familiar. “That takes guys that are doing the right things themselves, so they can show other people the way, and it takes a lot of courage to correct one of your teammates,” said Frost about what he asked from his players. McKenzie Milton has been one of the leaders in a number of players-only meetings this season. He sparked the conversation of the mountain’s peak during the spring, preaching that this team could go undefeated. The team met mid-season to keep the undefeated engine’s pilot light burning, and then again leading into the conference championship as Frost’s departure loomed apparent. When the decision was announced, and the fallout began, the team decided as a unit to welcome the staff back for one more shot at greatness. It makes sense. Their best chance to upset Auburn in the Sugar Bowl reads with Frost’s name printed at the top of the gameplan, standing side by side with the first team he has ever called his own. To bask one more time in the inferno that he and his players ignited together is only fair to those who had to freeze in the cold two years ago or even to those that came into the program and began to set the kindling. On Tuesday, when he permanently sheds Black and Gold to don Husker Red forever, that flame stays behind. UCF belongs to its own, to the players, as it has all season.